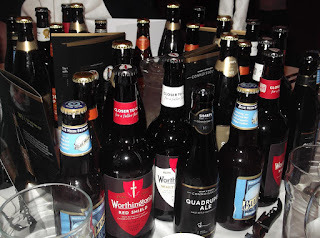 Is MolsonCoors - which is the lead sponsor of this week's European Beer Bloggers Conference - serious about craft beer? It certainly looks that way. As well as its US witbeer Blue Moon, its suggested dinner beers included bottle-conditioned Worthington White Shield and Red Shield, and both bottled and cask-conditioned Honey Spice no.3 ale from Sharp's. i had to mix my TYA4 with the coffee to manage it.